Welcome Aboard the S.S. Noel! 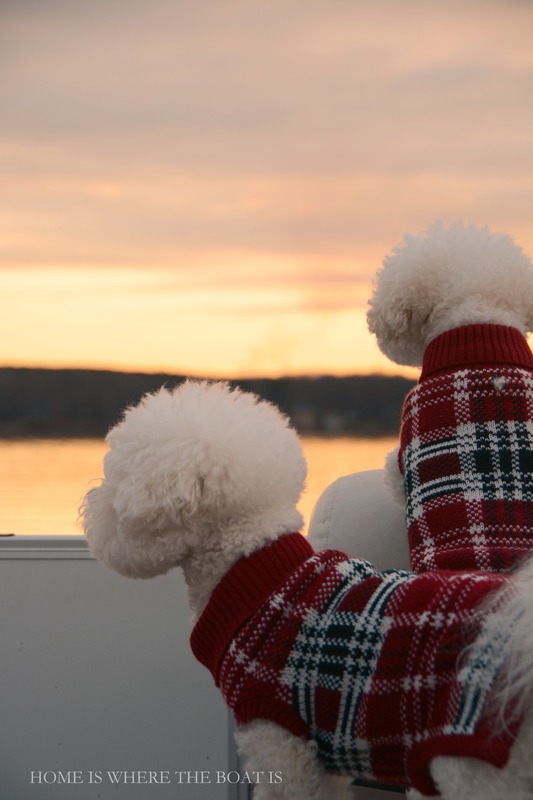 With the temperature in the 50’s, we’re enjoying a December cruise on the lake. 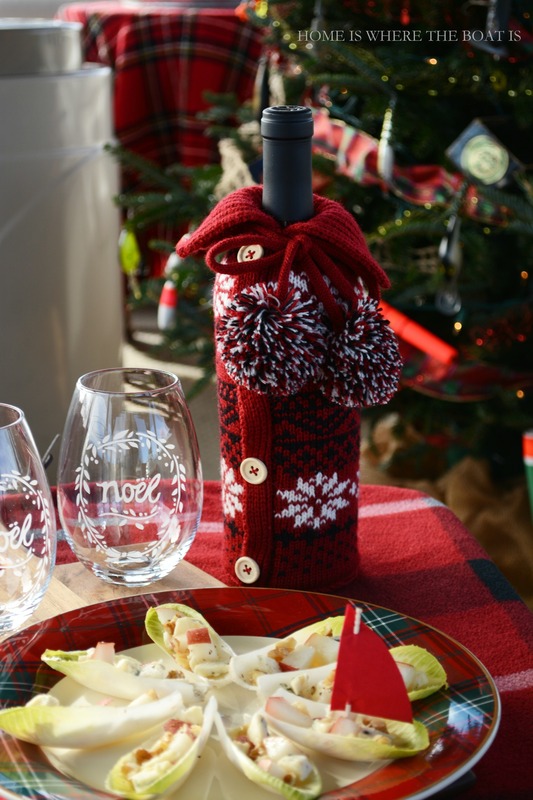 Pull on your sweater, grab a glass of Christmas cheer and a blanket to keep you warm and cozy! You’ll recognize our cabin stewards Chloe & Gracie, by their matching sweater uniforms, and they’re happy to welcome you aboard! Our O Fishing Tree moved from the dock to the pontoon this year. 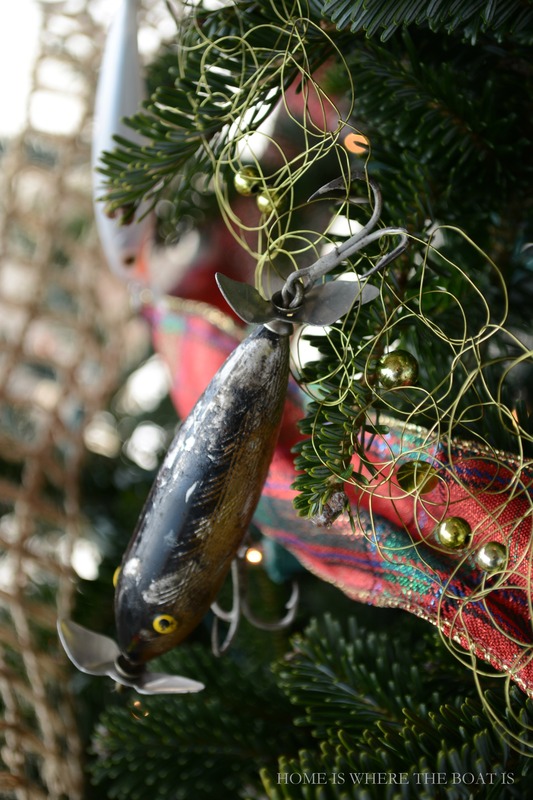 . .
It’s topped with fishing reels and glass floats, with lures from my hubby’s tackle box hanging as ornaments. 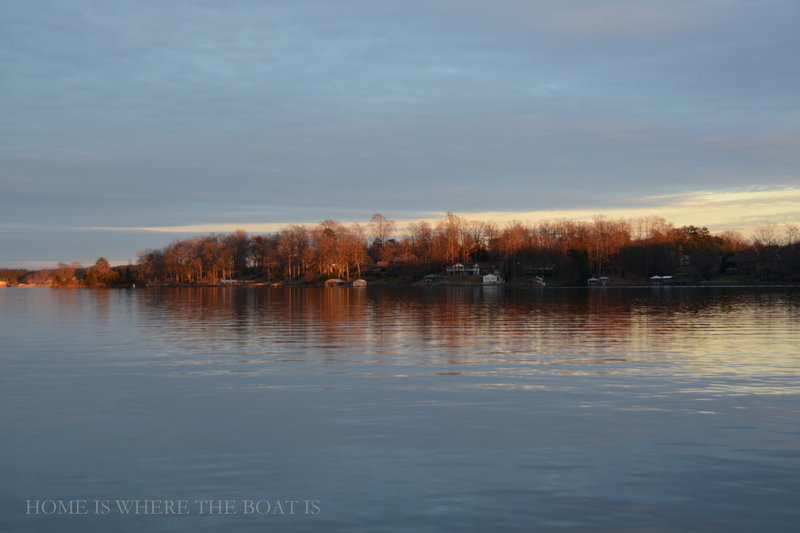 We generally don’t boat after November with the weather and hustle and bustle of the holidays, but the shopping is done and the packages wrapped, and we’re enjoying the gift of mild December weather. 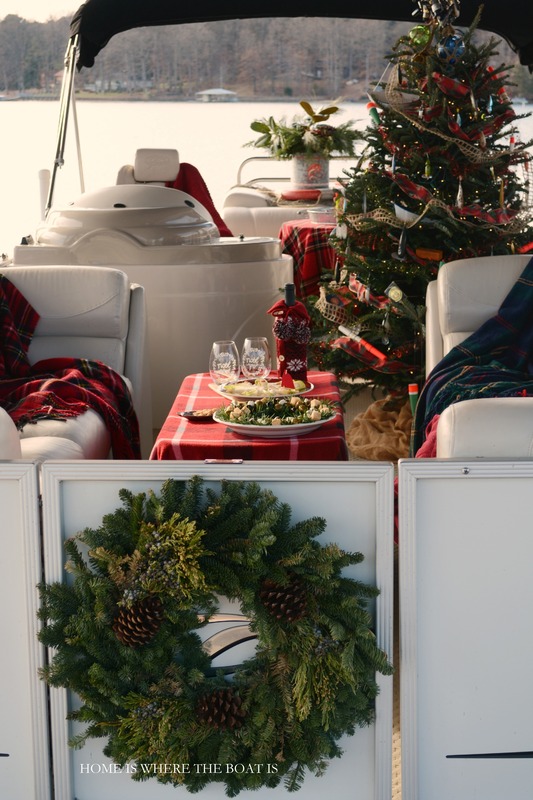 I decorated the pontoon for a winter cruise and fishin’ for fun, inspired by my advent calendar. 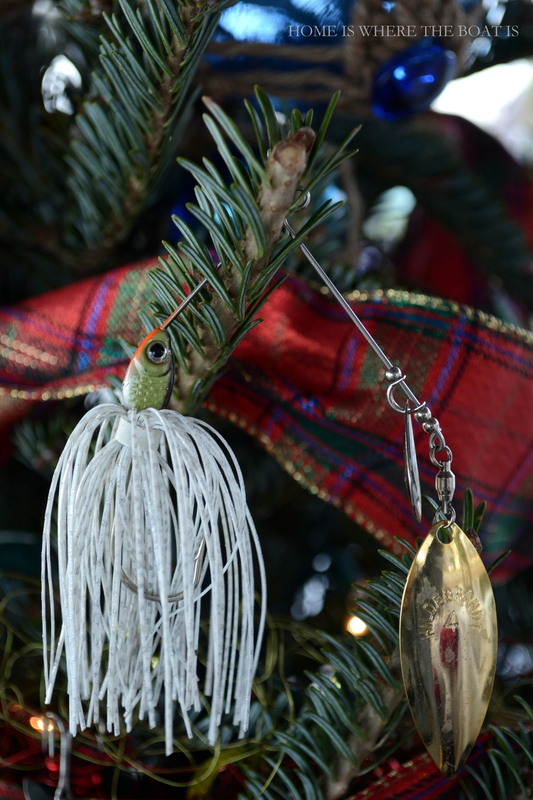 Spinnerbait, popping corks, floats, and some vintage lures from my hubby’s grandfather’s tackle box, hang from stretchy-wire ribbon, making this tree easy to rig. 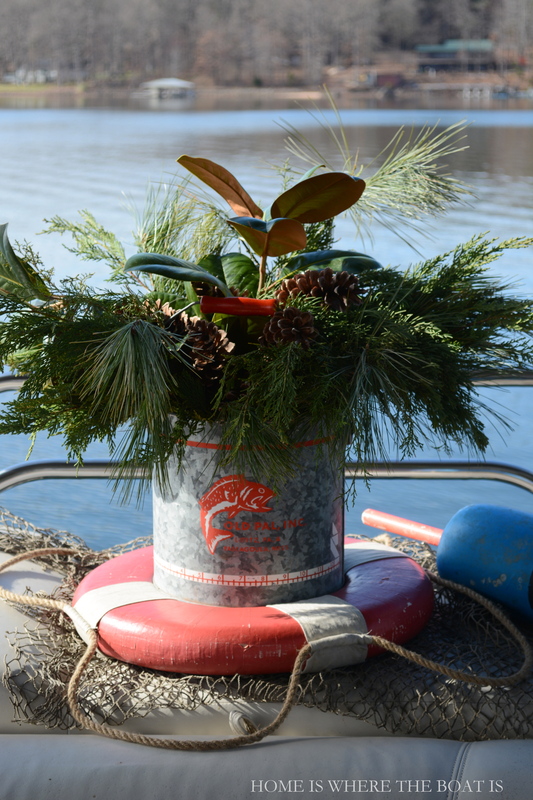 A vintage Old Pal Minnow Bucket is a providing a seasonal bouquet of Christmas greenery and pine cones. 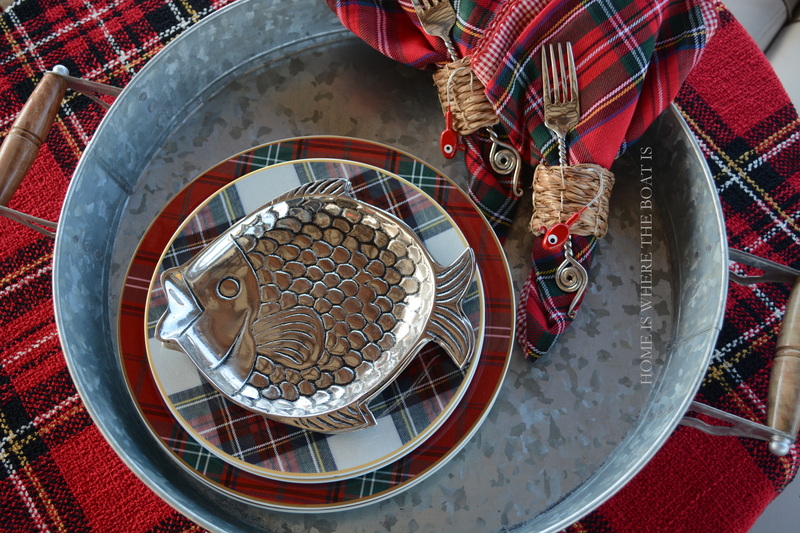 Tartan plates are stacked and topped with an aluminum fish plate, landed from Pottery Barn several years ago. 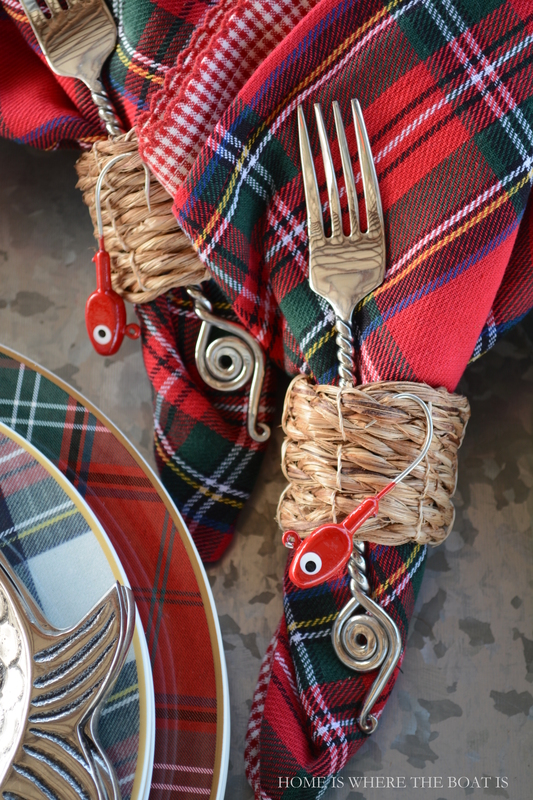 And napkin rings are hooked with a red jighead, catching a pair of napkins and fork. I have a couple easy appetizers to enjoy for our cruise. 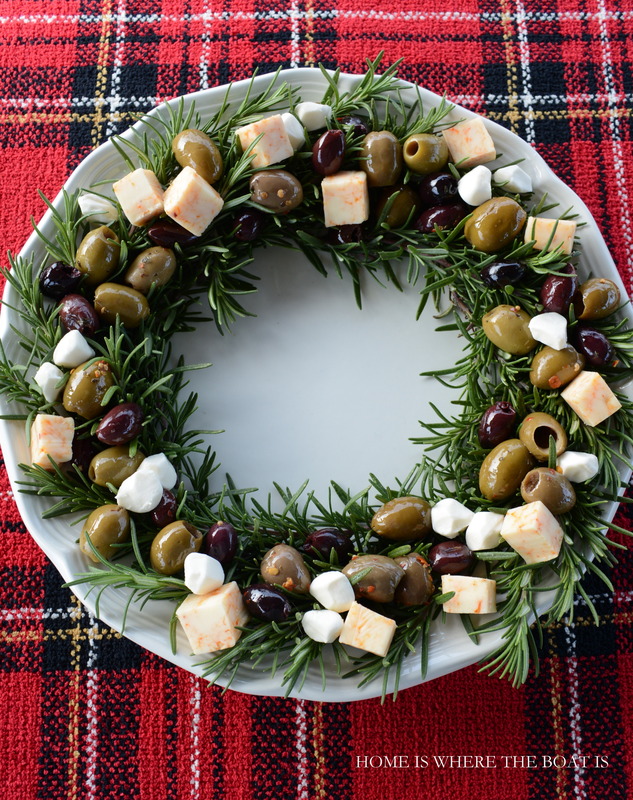 A rosemary wreath with olives and cheese! I cut our rosemary for this wreath, or pick you can some up in the produce department to form one. 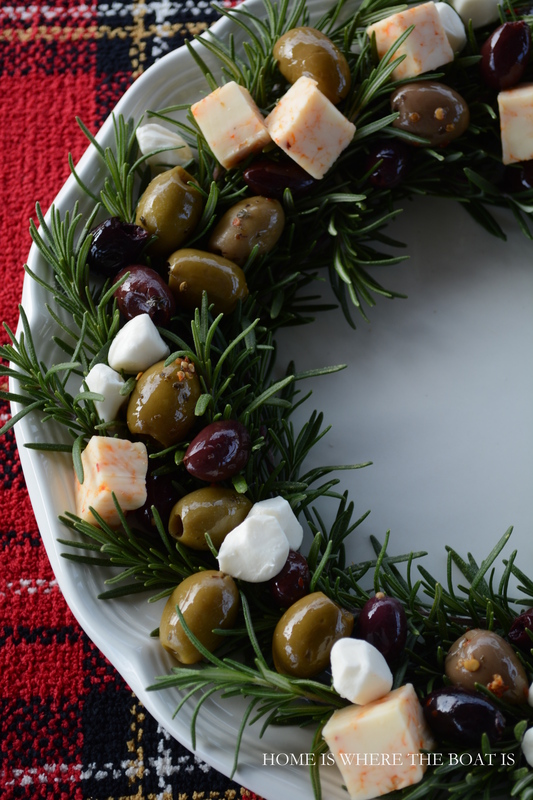 Add some olives, (if your grocery store has an olive bar it’s quick and easy to mix & match), add some cubed cheese, and/or mini mozzarella pearls. 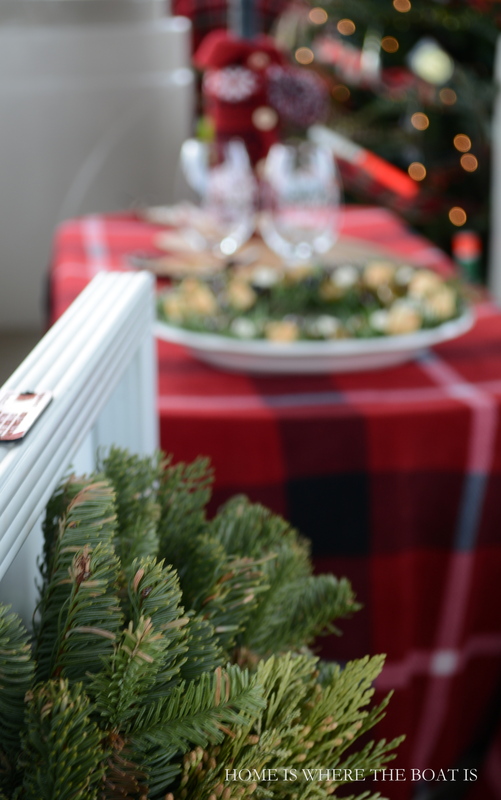 Sprinkle some cherry tomatoes in for a pop of festive red color on your wreath. 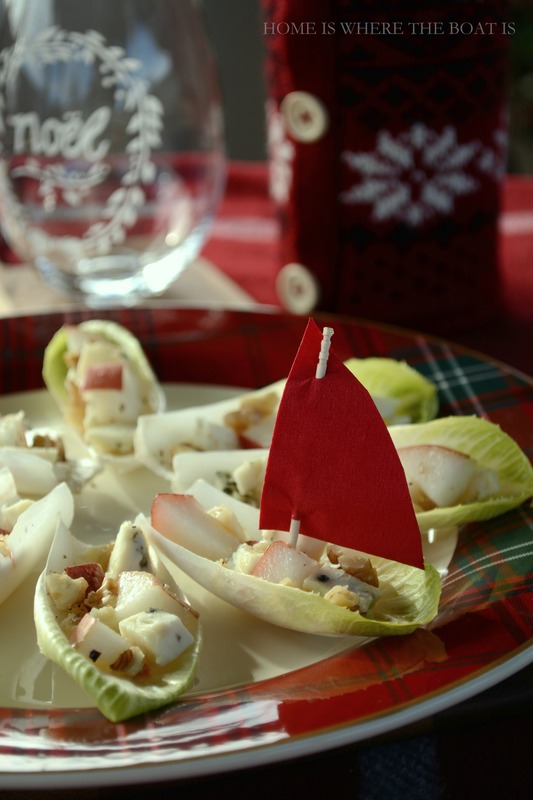 A boat appetizer seemed appropriate for a Christmas cruise~ Endive Boats with Pears, Blue Cheese, and Walnuts! I used a red pear for these boats that was ripe and already on the soft side. If your pear is firmer, dice it and add it to a skillet with a little oil and cook a minute or two on medium heat, just until softened. Remove from the heat, add a drizzle of honey to the pan with the pears. Let it cool a few minutes, then add your diced pear to your endive leaves along with chopped walnuts, crumbled blue cheese, and salt & pepper. A sail cut from a napkin is hoisted with a toothpick mast! 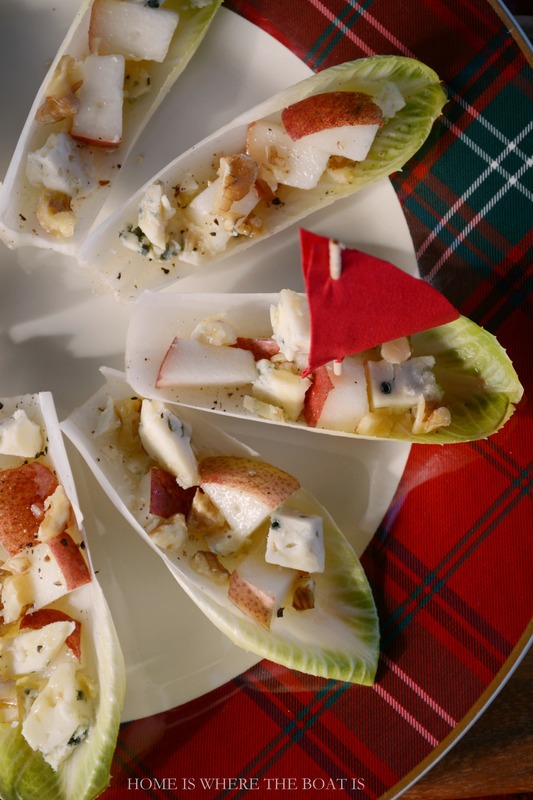 You can find the recipe for Endive Boats with Pears, Blue Cheese, and Walnuts from Cooking Light, here. 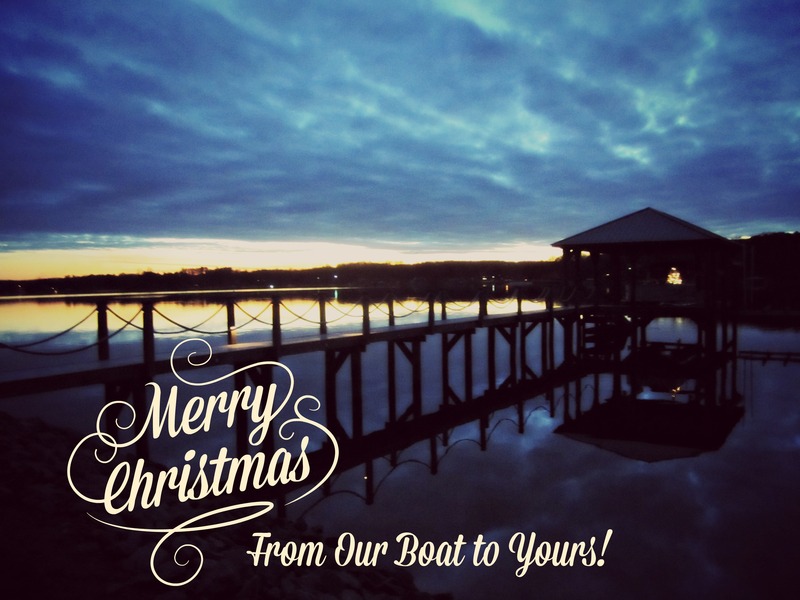 Merry Christmas, From Our Boat to Yours! This is magnificent! The thought that must go into this and the detail is just amazing! LOVE LOVE LOVE!! My husband and I are outdoors folk and love to fish, tent camp and hike . Your blog fits us and brings a smile to our faces…and we have a little pup by the name of Jack! Thanks for all the inspiration with paraphernalia that is everyday life to us. Merry Christmas and may your New Year 2015 be healthy, happy and outdoors filled! 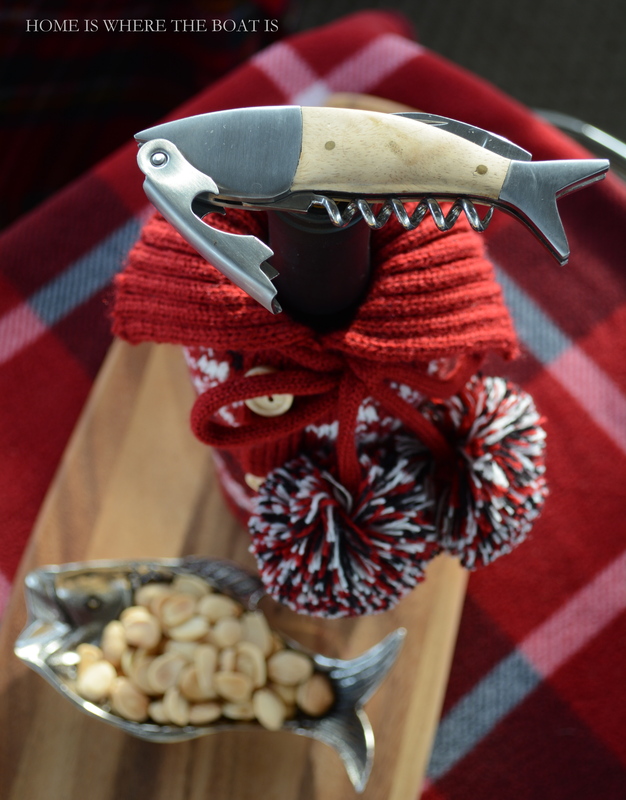 Is the “Fish” bottle opener an antique? I love this posting it is so pretty and the pups look simply AMAZING in their matching sweaters. They crack me up- you can tell they love cruising on the boat and especially the Noel version. Have wonderful and healthy holidays and relax. Oh, and the rosemary wreath is genius – I definitely will be copying that. What a pretty appetizer. Love :) Always enjoy your posts. Merry Christmas! Today is my birthday and Iwant to thank you for starting off my day with your cruise. The “girls” just make me so happy and everything was just lovely. Have a Blrssed and Merry Christmas and a peaceful New Year. Looking forward to seeing your posts in 2015. Thank you for a wonderful post- Merry Christmas to you and yours! 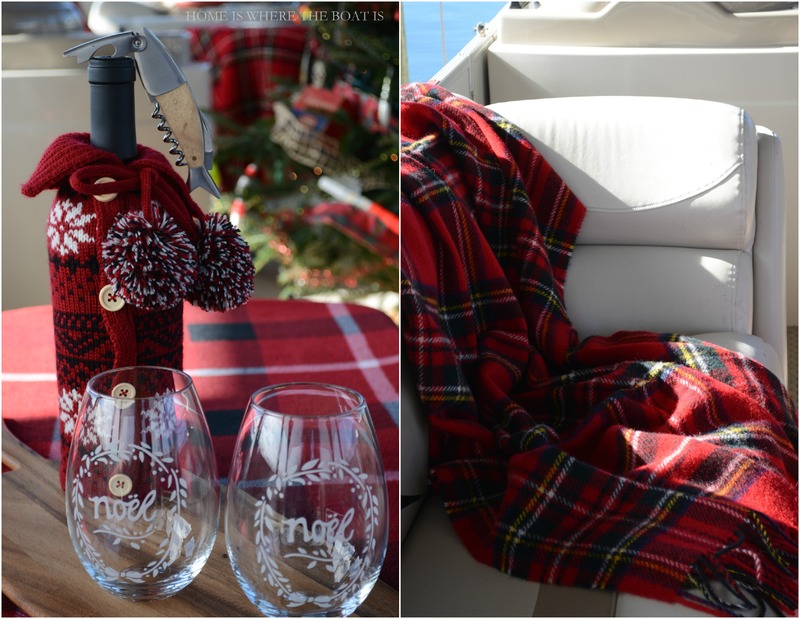 Your Christmas cruise is pure plaid delight Mary! Your nautical tree [my all time favorite] looks so happy afloat with your sweater clad stewards and all your fishy decor! 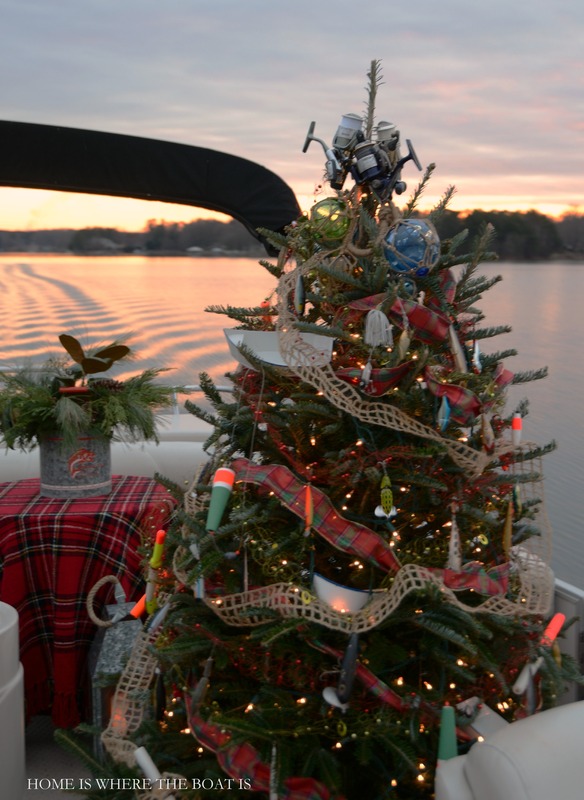 We are always in Bham for Dec, but I am hoping to catch a boat parade on the coast one year where people decorate their boats to the max with lights and all things holiday and parade the local waterways~ do you have a holiday boat event on your lake? 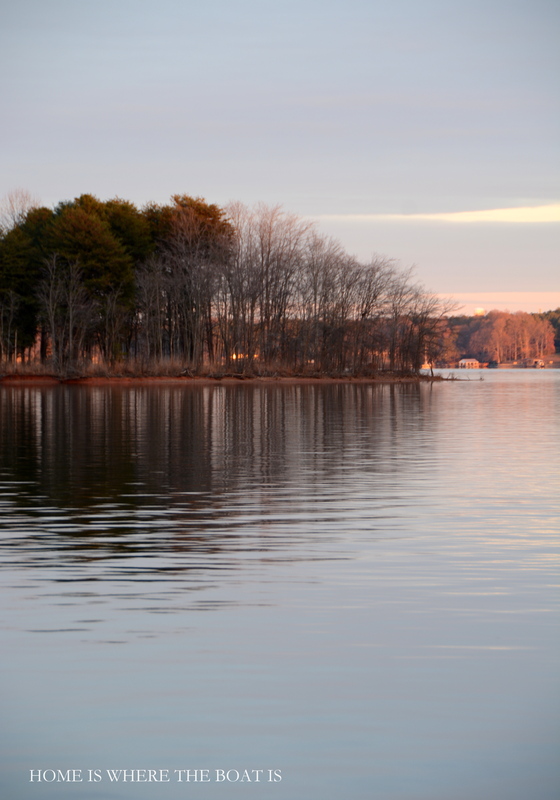 We hope to catch some warm weather over New Years for a little boating. Love the rosemary wreath, and the endive boats~ Have a very Merry week Mary, and thanks for all the fun, yums and smiles you have brought this year! Oh my! You are so talented and creative! Love your furbabies all decked out for the holidays. Simply splendid Mary.. I was searching for a just the perfect app idea and behold your rosemary wreath is just the ticket. I enjoy your site tremendously and look forward to receiving your posts. So over the top cute, Mary. Merry Christmas to you! Favorite post this season! 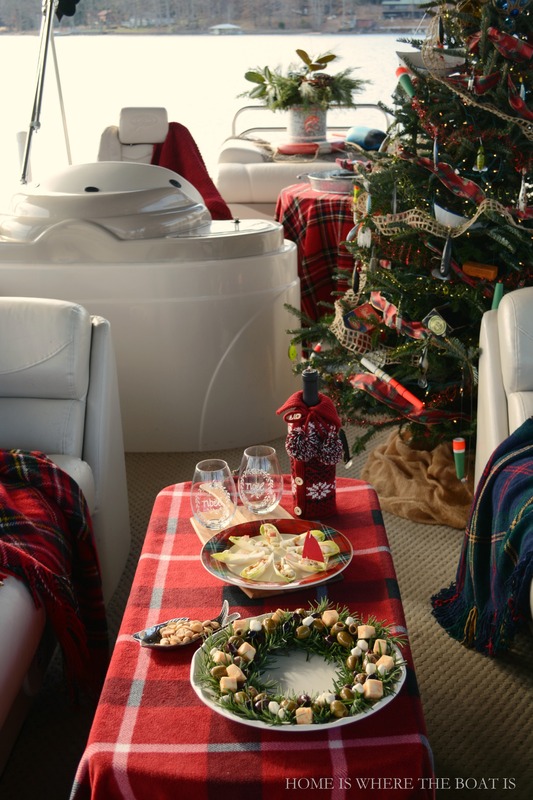 Just puts us right on the boat with the tree, the dogs and the goodies. A wonderful photographic get away. Love, love L*O*V*E this post! We haven’t been to the lake in months….we’ve been too busy with school activities and team practice, but I keep reminding hubbie that I can homeschool from anywhere! LOVE the tree~you are so clever, Mary! Thanks for the delightful inspiration!!!! You bring so much joy to my emails daily. I have to say this post is my favorite. Rosemary wreath looks incredibly yummy and my rosemary needs pruning! Thanks for the wonderful idea. Cutest stewards ever! :-) Thank you for the Christmas cruise. It is lovely! The Rosemary wreath is so clever. I think I will make a small one for Christmas Eve. Hope your Christmas is lovely. 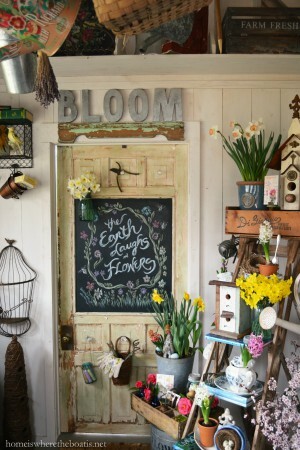 Love the rosemary wreath and the endive boats. The babies are beautiful in their plaid outfits. Merry Christmas to you and yours. Simply lovely all of it. You are ingenious, I so look forward to your posts. Merry Christmas to all! So welcoming are your cabin stewards! 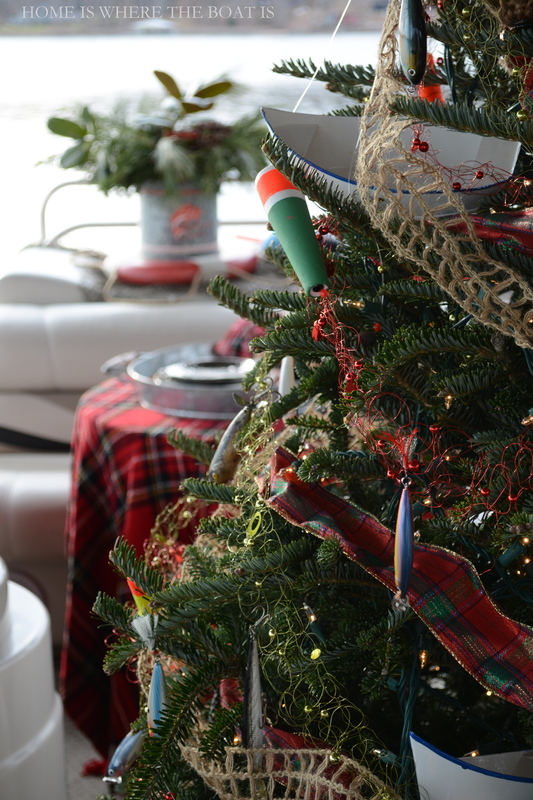 Love your fishing Christmas tree and boat. So fun! Merry Christmas Mary to you and your family. Beautiful as always. Your little furbabies are adorable. I would love to cruise with them in charge. Your design is so inspiring but doable. All the best for a blessed Christmas for you and your family. Mary, you always share the most fun ideas! I love your blog. I wanted to tell you that we took your idea and decorated a gingerbread house for out birds. We had so much fun. Thanks for always sharing your wonderful talents and creativity. Merry Christmas! what a gorgeous setting! 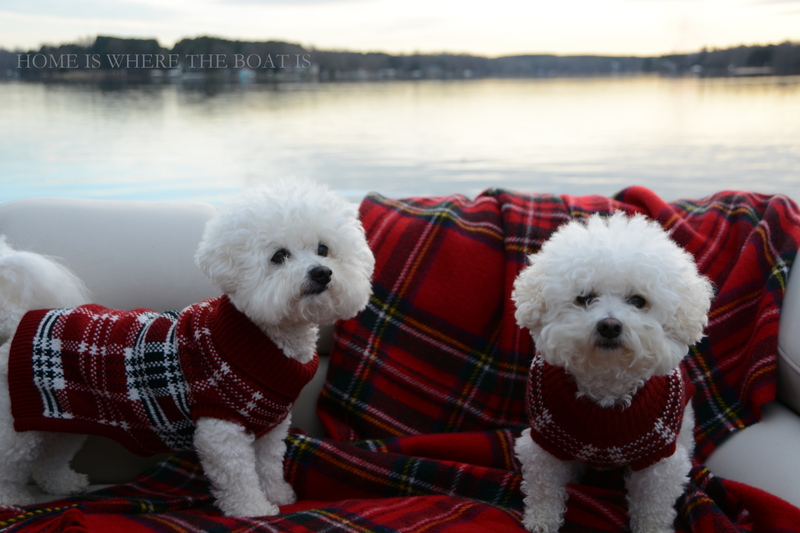 love the sunset photos and the little girls are adorable all dressed in their Tartan sweaters! Have a wonderful Christmas! Your attention to every single little detail should not come as a surprise any longer, but …it does… You’re amazing, Mary….and I sure hope you have a band of elves helping you to transport everything for storage to your setting destinations…! My very best wishes for a wonderful Christmas to you, hubby, Chloe and Gracie! Oh, how I envy you a cruise on the lake. 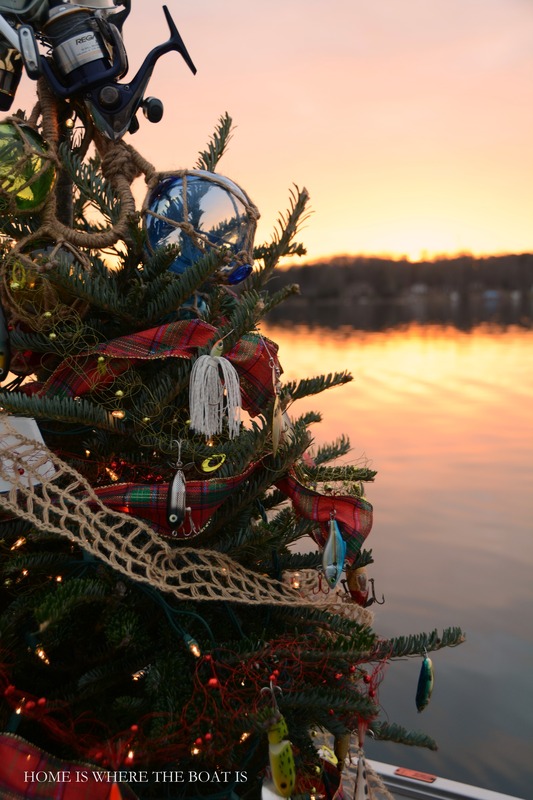 It all looks so calm and serene, but certainly festive on the boat. The girls are adorable as always. I wish Sadie liked to wear her sweater. I think it is so cute. Her coat is so long that it mats when I have her wear the sweater, so haven’t had it on her this year. Your tartan table is delightful. I’m going to pin your rosemary wreath idea. It would also be a cute thing to add to a cheese ball or brie in a pastry. Thanks for the idea! This is just fabulous. What great cabin stewards!! Pictures are gorgeous, really enjoyed going on this cruise with you!! i was wishin and a hopin you would get in the winter cruise, i was almost positive it would happen, but tick tock, time was flying by! i squealed when i saw it, almost called you since you know how i hate to type and time has been so thin… you really outdid yourself this season, i so hope you enjoyed having a puppet master behind the months tasks! just point you down the yellow brick road and oz is always in sight! 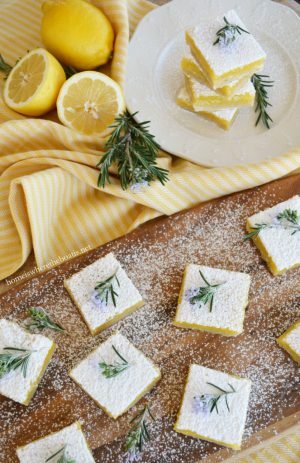 details details details = DELIGHTFUL! the wreath is gorgeous too, i have been admiring it myself, looks delish! love the sail boats too, such a tasty combo. love love loved being on the water with you, thanks for such a merry season with all your flights of fancy! Visit your blog from time to time. It is pure torture in a good way. You are living one of my retirement dreams…(smiles) Not there yet, but a girl can dream… This is a gorgeous post and every detail is delightful. 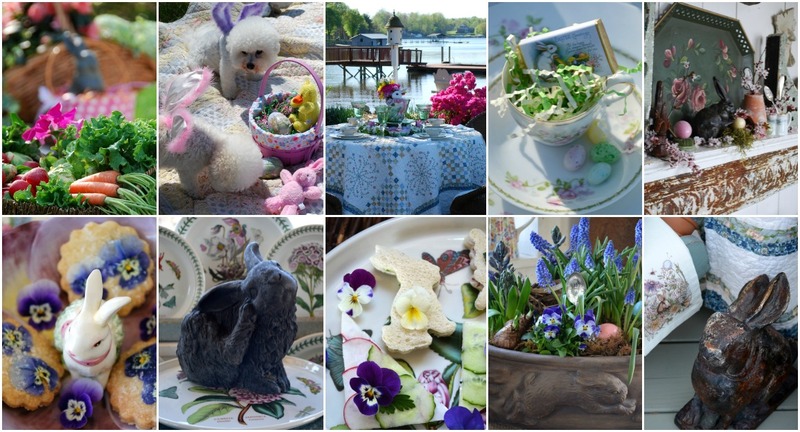 Love the rosemary wreath and endive boats. What cheese could be substituted to use, if one is not fond of blue cheese? Love all the plaid….how fun. Oh, the life of the cabin crew! This post should be in Coastal Magazine! Up here in the Midwest, waterside moments are memories for now. Happy Holidays. Oh, what a dream! You must have enjoyed so much. Always love seeing the doggies. Just precious. Everything is so wonderful! Thank you for sharing your passion. So wonderful Mary!! Everything looks GREAT….as always!! Thx for sharing with us, all your great ideas!! OK, Mary, we will take you on a Maine boat outing any time provided you can work your magic on Pipe Dreams! Have a very Merry Christmas, and I look forward to sharing your creativity in the new year. 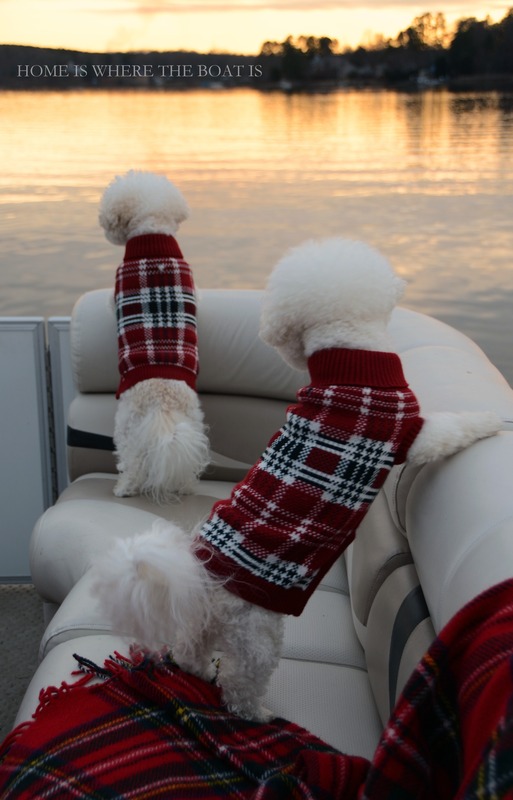 Your creativity is just non-stop, Mary, down to the last detail of the pups in plaid sweaters! 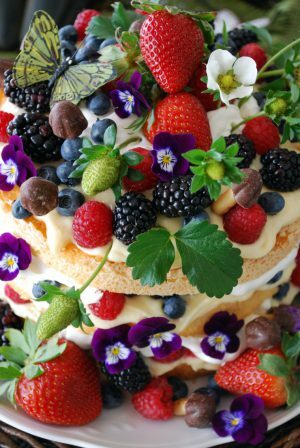 Looks beautiful and yummy–I am copying your rosemary wreath for next Xmas. Happy holidays! Mary, this is exquisite! I wish I were boating with you. What a lovely way to celebrate Christmas. 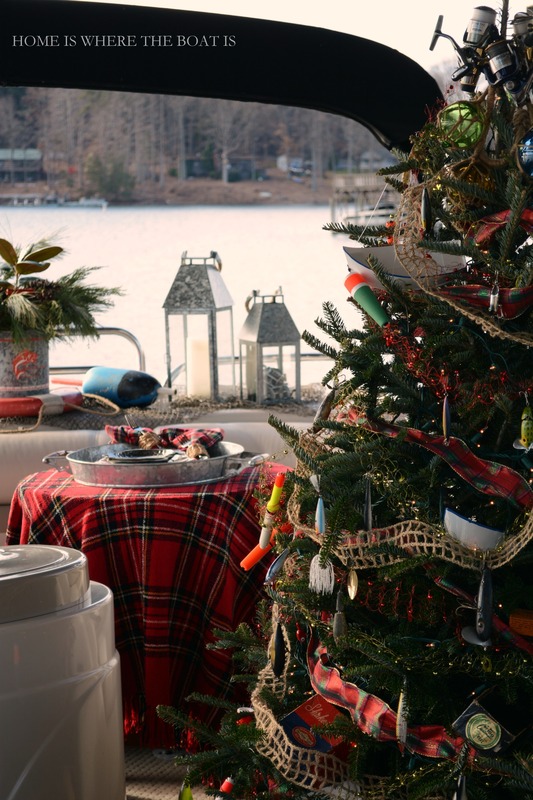 I have never seen a Christmas tree on a boat before. The girls are lovely in their Christmas sweaters! Enjoy the wonderful weather and the beautifully decorated boat!! You have a way to turn ordinary into extraordinary ;). Taking time before Christmas to relax and enjoy is just pure delight!! Love how the girls get so excited on the cruise, just makes me giggle watching them taking it all in, they do love to go, don’t they!! 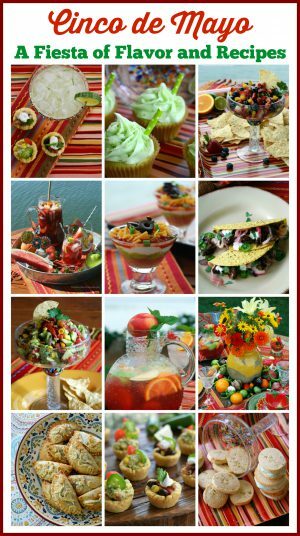 LOL Your appetizers are lovely, Love how you incorporate natural flora and fauna with food; appreciate how you make them simple, tasty and beautiful. 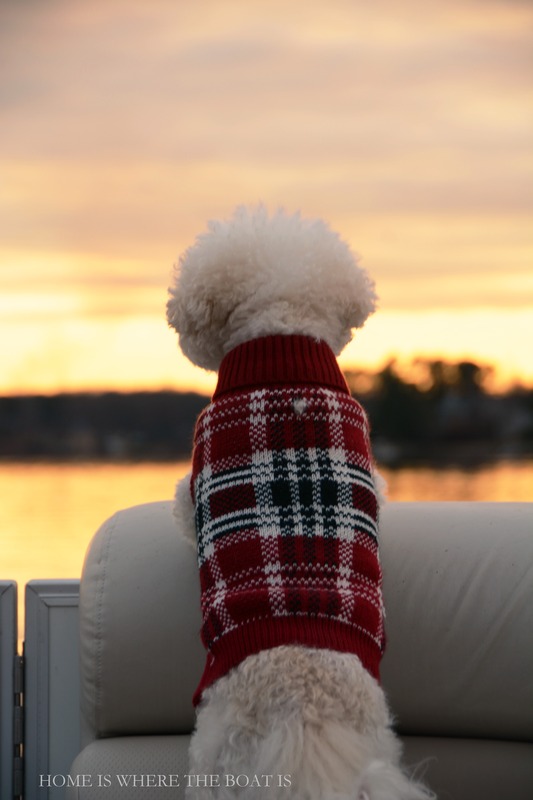 Ahhh,, the sunset pictures of the glorious sky reflected on the lake with beloved Chloe and Gracie taking it all in, the Christmas Fishing tree all lit up in the sunset and you seizing the moment, creates the most beautiful memory of a place in time…… A ,beautiful reprieve…… amazing story…., unforgettable memory. Thank you for sharing what life looks like through the eyes of an artist and inspiring me and your readers to create more glorious days, sunsets and unforgettable Christmas memories. 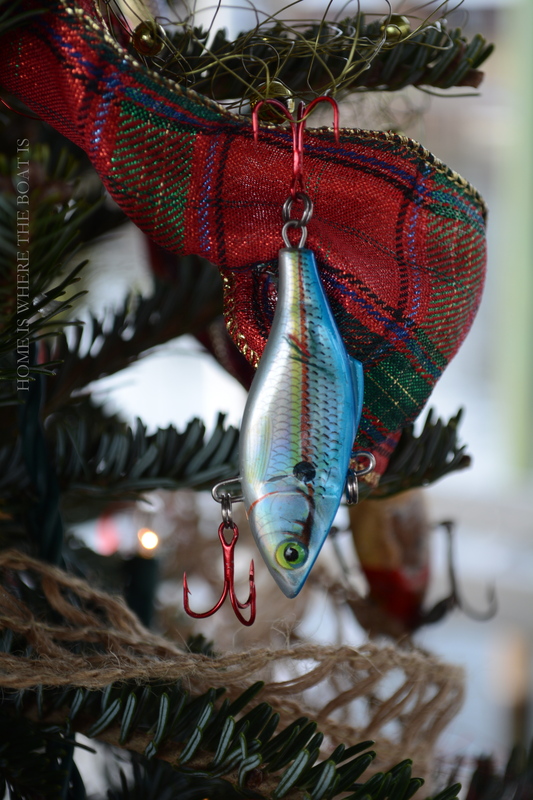 I am so happy to see that fishing themed tree again this year!..It is one of my favorites!….and the girls are so very cute in their outfits!…I love the appetizers and how they are so magnificently presented…the wreath is an amazing idea!…I lost my rosemary bush last winter…Merry Christmas to you and your family Mary!…you are the best and I so look forward to your over the top, amazing creations in 2015…thank you for being a friend…oh, that sounded too much like a Golden Girl…but I am getting there!…. This is awesome Mary!! Have a very Merry Christmas! So lovely! That fishing tree is gorgeous. Oh, my! Look at all this plaid! I’m in heaven! Everything is just gorgeous! I’m glad you’ve been able to extend your enjoyment of the lake! Merry Christmas! Hope that your Christmas was a merry one. You are so clever…love your blog! What a beautiful post! The pooches are so smartly dressed, as are your table and tree! Happy holidays! Adore this post, and the doggies in tartan, perfection!! Thank you for sharing! This is the cutest! I know I saw it before but don’t see my comment so I’ll do it again! 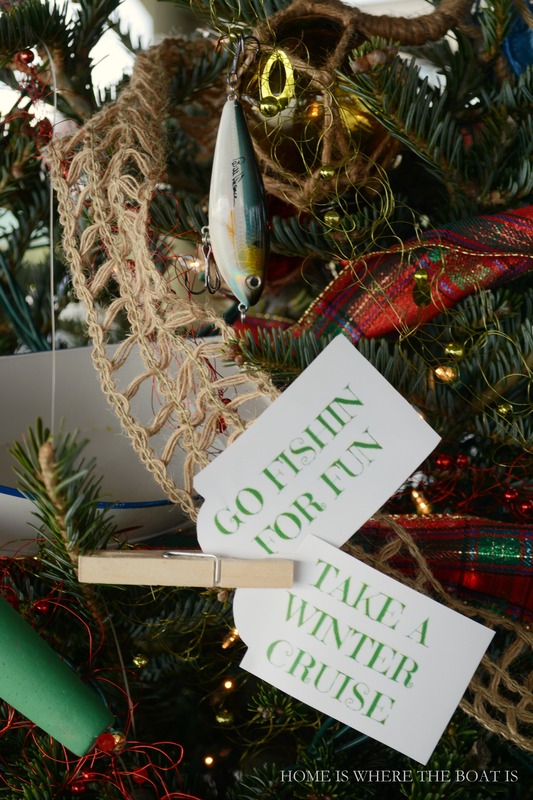 The sweaters are the cutest on the girls and the little “fishing theme” tree is adorable. I wish we could cruise on a lake but up there they are mostly frozen over now. Best wishes for you for a very Merry Christmas! OH MY GOODNESS! This is just ADORABLE!!! 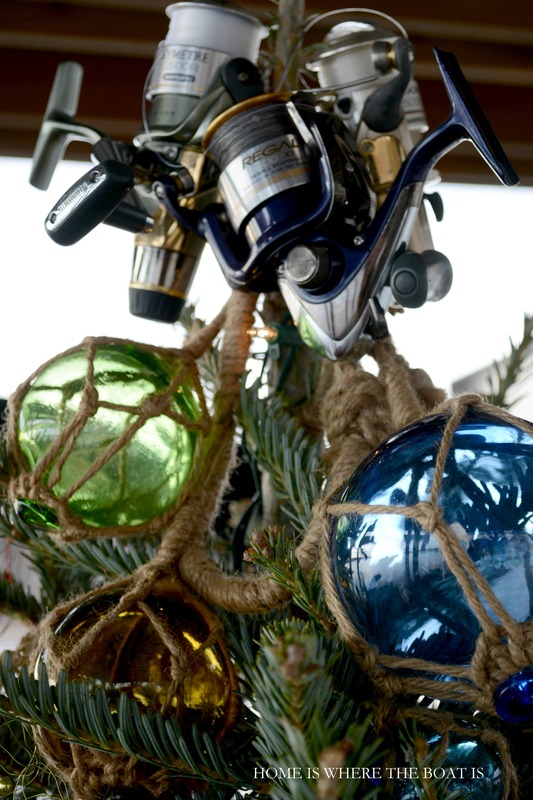 LOVE the Fishing Christmas tree!! Such a delightful cruising post from a most creative lady. I know the work that went into this beautifully decorated boat and then the photo session which is perfect. Merry Christmas to you and your furry kids.